This page was originally a handout for a couple of our microbiology lab courses and is adapted from our glucose catabolism page at http://www.jlindquist.com/generalmicro/dfglucosenf.html. Original Paper: Rudolph Hugh and Einar Leifson. 1953. "The Taxonomic Significance of Fermentative versus Oxidative Metabolism of Carbohydrates by Various Gram Negative Bacteria." J. Bacteriol. 66 (1): 24-26. The use of this medium in an instructional laboratory course should follow the original intention – i.e., to be able to differentiate between gram-negative bacteria (1) that can ferment, (2) that only catabolize glucose by respiration and (3) that do not catabolize glucose at all. This differentiation is not as important in the identification of gram-positive bacteria, and it so happens that gram-positive bacteria do not grow in Glucose O/F Medium well (if at all) anyway – probably because of some sensitivity to the pH indicator. Certainly use of this medium should not be a critical consideration when it comes to the determination of oxygen relationships for which the reactions of Glucose Fermentation Broth and the catalase test are more relevant. Also, it would be a waste of time and money to use this medium to characterize gram-positive cultures. Glucose is a sugar from which most common chemoheterotrophic bacteria can obtain energy by fermentation and/or respiration. Glucose can also be utilized as a source of carbon, but these media include a large number of potential carbon sources (amino acids as well as glucose), and whether or not glucose is used as a carbon source cannot be directly determined from the reactions seen in these media. Peptone is a commonly-used medium ingredient which mainly supplies amino acids (sources of nitrogen, carbon, sulfur and energy for many bacteria). A minimum amount of peptone should be incorporated in the medium, as overabundance of ammonium (alkaline) released from deamination of amino acids can neutralize the acids. pH indicator: Brom-thymol blue turns yellow with a net acidic pH and blue with a net alkaline pH. Whether an organism can respire or ferment glucose can be tested with Glucose O/F Medium. A small amount of acid production can be associated with glucose respiration and can be distinguished where a strict aerobe is growing – i.e., at the top of the medium. If the organism were a facultative anaerobe, this acid formation would not be distinguishable due to the large amount of acid associated with fermentation which would be diffusing throughout the medium. Duplicate tubes are inoculated for each organism, and the medium in one of the tubes is overlayed with mineral oil. Mineral oil does not in itself cause anaerobic conditions but rather prevents oxygen from continuing to diffuse into the medium. After incubation, one looks for the presence and location of growth and acid. 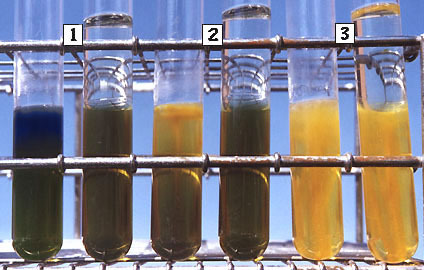 It is important to emphasize that this medium contains relatively less peptone and more glucose than Glucose Fermentation Broth, so the acid associated with respiration can be detected in the aerobic part of the non-overlayed tube – if it is not made indistinguishable by acid production from fermentation which turns both tubes yellow throughout. Note the examples shown below. For each pair of tubes, the tube on the right was overlayed with mineral oil after inoculation. First pair of tubes: Tubes were inoculated with a strict aerobe which neither respires nor ferments glucose – therefore no acidic reaction. The blue alkaline reaction shows up where there is growth at the top of the "aerobic" tube. This is the negative reaction. Aerobic deamination of amino acids – not relevant to glucose catabolism. (Acid diffuses throughout both tubes.) – – +!! Page last modified on 10/8/11 at 11:00 PM, CDT. John Lindquist: new homepage, complete site outline.